Yesterday there were 58mm of rain, starting in the afternoon and then all through the night. It was wonderful and much needed, a slow steady soaking. I had managed to get the lawns limed and fertilised just in time, so now it's all well watered down. Today there seemed more bird life than ever, darting and squawking though the Grevilleas and now the predicted evening showers have arrived as daylight fades with the fire going, the candles on the mantlepiece alight, and all the water tanks are full again. I love this house. We have a new conservative Government although the swing was quite small, and as happens here, large numbers of seats can change hands simply because one or two or three people in a hundred change their vote. That this is called a mandate to do every rat-bag thing they promised to get themselves elected is exactly that - rat baggery. But then they are, rat bags. Not so much beholding to Murdoch and the odious Catholic Cardinal Pell, as creepy as any cartoon version of creepy churchman, but of shared values - a Ministry devoid of women except for the spiteful small minded Julie Bishop, and no minister for Science. Not since the 1930s. Knowledge is toxic to these people. It informs, exposes myth, and defends truth. So there's no room for that, or them. Scientists can count themselves lucky they're not burnt at the stake anymore. Though starved they will be. And the leader - this person who believes climate change is 'crap', that the planet was warmer when Jesus was alive, and that people zoom up to heaven through the clouds. There's something worryingly suspect about his anti-gay stance, for a man so committed to exaggerating his masculinity, with Putin-esque like photo shoots in speedos, and lycra bike gear, and driving trucks and fighting bush fires, rah rah, and who, while the Prime Ministerial residence in Canberra is being renovated, will lodge at the Australian Federal Police Academy, eschewing a hotel or other residence of character or style, but living in with the boys, with a gym, and common shower rooms perhaps. Now all politicians by definition are bereft of style, but this descent into the common and vulgar is a new low. Still, the tanks are full. And the pie is ready. I promise I'll be around more often, and do apologise for the yawning gap - the days and nights have been well spent and while blogging seems to be something I just can't do in a hurry, I do intend to do more frequent little hellos and up-to-dates. It is my diary after all. The mention of which prompts me to note I have just finished read Paul Monette's coming-out novel, diary almost, "Becoming A Man" which I enjoyed very much for the writing and politics (it had been leant to me by someone whom I suspect had much in common with the stunted acceptance and exploration of his sexuality - as for me, I needed brakes) and have this evening, lying on the bed with the dog listening to the pitter patter on the roof, started on "Berlin In Lights - The Diaries of Count Harry Kessler". Literate dawg (love that photo). Plenty more where that came from (East of Eden). Must read Kessler's diaries. Anything about his being instrumental in the creation of Rosenkav? Afterwards I visited Thomas Mann, living only a few hundred yards farther on in a handsome villa. Very large and light study with a fine view of the lake. He talked about my memoirs, which greatly appealed to him and from which he quoted certain passages. Then he spoke of Hofmannsthal. To his mind Der Rosenkavalier will prove immortal, a completely successful work, like Figaro, the Barber, and Carmen. I told him of my share in the scenario. Later Frau Mann arrived and the conversation rather levelled off. Mann told me that he is working on a major Goethe theme, a visit by the sixty-year-old Lotte Buff to Goethe in Weimar. Once, in earlier years, he wanted to use Goethe as a character in a piece of fiction, but then lacked the courage to attempt the venture. Instead he wrote Death in Venice, transforming the Goether-Marianne von Willemer situation into that of an author (a figure based more or less on himself) in love with a boy. This must have been just before Thomas Mann escaped to America. His son Klaus was already there, having fled to Paris some years before (The Turning Point). Steinbeck must get my attention. Thanks for the prompt. I recently reread Of Mice and Men, when the opera was staged here, so East of Eden is next. Nice pic. The Monette is good, I agree. I had a copy but think I may have disposed of it - hopefully to a good home. PS: the bird is good but I meant the dog. Thanks M. About time you had some more life-in-my-yard shots again. Mind you, that pic from China is a cracker. Any more? And hello again to you! Here is my favorite take-away line: "Knowledge is toxic to these people." There are, unfortunately, an endless number of uses to which such a line can be put. 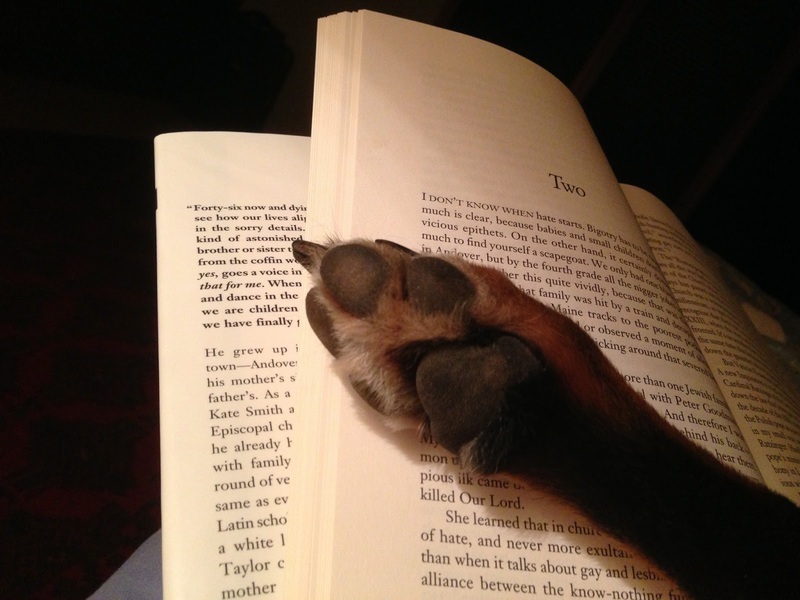 Meanwhile, I do love the paw on the page--and is that a phoebe up top? We have them here, they flit around in the backyard around dusk these days. This morning, two almost grown foxes were gamboling under the trees. That was fun to watch. M, all I can say is I hope you enjoy it more than I did, and that is both halves of the concert. I see your comment over at Sarah's, and I haven't read McCallum's review yet, but I really didn't like it all, neither the concept (we have heard one such arrangement before haven't we? with Edo) nor the execution. And the Chopin wasn't to my taste. Heavy handed comes to mind. Not a satisfying night for me at all. Not a phoebe Sue; we don't have any. But I think it is an immature honeyeater, possibly the White-naped honeyeater. It's tiny - the photo taken through a window with a zoom. Love the red eye make up for a day out of the nest.